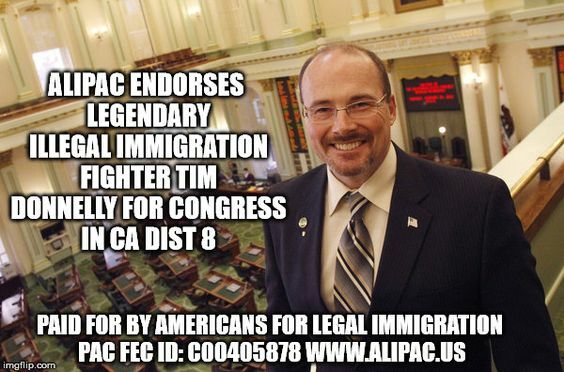 Americans for Legal Immigration PAC is endorsing Tim Donnelly for Congress in California's 8th district due to Donnelly's strong stances and many years of advocacy against illegal immigration. Stopping illegal immigration is listed as the top issue on Tim Donnelly's campaign website where he states, "Build The Wall: We must enforce all immigration laws without favoritism and restore our national sovereignty and the rule of law. Unchecked illegal immigration has cost California taxpayers over $20 Billion per year, diverting resources that could go to taking better care of our veterans." Tim Donnelly has completed ALIPAC's 2018 Federal Candidate Survey where he promises to oppose "changing existing laws to accommodate millions of illegal immigrants through 'immigration reform,' DACA, Dream Act, or Comprehensive Amnesty which would allow illegal aliens to either have a path to citizenship, a new visa, or some new form of legal status which would eventually lead to a new voting bloc of 11-20 million illegal immigrants, which would in turn destroy any future hopes of border or immigration law existence or enforcement by handing permanent political power to the Democrats and Socialists." ALIPAC is adding Tim Donnelly to the national organization's list of campaign endorsements (View), and is asking supporters to vote for, donate to, and volunteer for Tim Donnelly's congressional campaign in California's 8th district. Tim Donnelly deserves support from Americans coast to coast because his fight against illegal immigration has made headlines since the time ALIPAC was founded on 9/11 of 2004. "Tim Donnelly is an important proven leader in the national movement that arose to fight against illegal immigration, unprotected borders, and Amnesty 14 years ago," said William Gheen, President of ALIPAC. "Donnelly would be a powerful ally in Congress to those of us fighting to save American jobs, tax resources, and lives from the many perils illegal immigration forces upon American citizens." ALIPAC is also supportive of Tim Donnelly's campaign issue of opposing abridgments of American 1st Amendment rights being conducted by a cabal of leftist corporations in Silicon Valley who are violating the Civil Rights of American conservatives, Christians, Republicans, and non-socialists through a clearly established pattern of censorship and shadow banning. Donnelly promises to "Stand for the first amendment and end censorship in silicon valley. Increasingly, we see the rise of new monopolies in Silicon Valley conglomerates control most of digital and social media. Companies like Twitter, Google, Facebook, Apple, etc. are openly political and use their incredible reach to censor and silence any speech they don’t like. Free Speech rights and the First Amendment must be protected everywhere—even in this new digital space." For more information about ALIPAC's early experiences with Silicon Valley censorship and suppression, and our 14-year national battle against illegal immigration and Amnesty, please visit www.ALIPAC.us. Last edited by ALIPAC; 08-20-2018 at 01:01 PM.